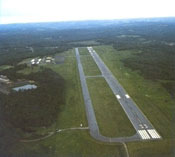 Nestled in the foothills of New York's Catskill Mountains, the Sullivan County International Airport is a great pilot destination. With it's 6,000' runway, ILS, GPS, VOR and NDB approaches, weather is rarely a factor. This is where our main repair shop and staging facility for overseas shipping are located. Although we could easily perform our work at an off airport location, we strongly believe that as an aviation business we need to be around aviation.